Kids First is excited and proud to present Foundations, a refreshing and unique approach to physical, social and emotional education for children with developmental challenges. Far less expensive than one-on-one therapy, Foundations classes have a great emphasis on social integration. As progress is made, our goal is to include each child in regular Kids First programming. Occupational, Physical, and Speech Therapy services will be offered in a group setting, with a focus on sensory integration, and motor learning, and communication. Our unique small group approach, within a recreational setting, will offer one-of-a-kind services utilizing evidence-based treatment interventions. This program will benefit children of all needs and ability levels, helping each one of them to maximize his/her potential by giving them the right challenges to assist them in learning and growing into the best they can be. By working to ensure a strong foundation for learning and development, therapy services can enhance children’s abilities to master skills. CHARTER MEMBERS GET 20% TUITION DISCOUNT FOR LIFE! A LIMITED number of Foundations Charter Memberships are Available for early adapters! Charter Members get a 20% discount from Small Ratio Therapy Class tuition for LIFE! Enroll as a Charter student and you will receive a 20% discount off the Foundations Small Ratio Classes for as long as you are continuously enrolled. There are a limited number of Charter memberships available. When they are gone, they are gone. If you you un-enroll from classes for any reason Charter status is revoked. A 20% discount will also apply to Evaluations and One-On-One Therapy for as long as Charter Memberships remain available. After all Charter Memberships are gone, these discounts evaporate. Due to the depth of the discount, the Charter Membership discount cannot be combined with the regular Kids First Sibling/Multiple Class Discount or other promotional offers. Foundations therapy was created with the goal of helping each child grow and learn to the best of their abilities. By looking at what underlying skills are causing deficits and working to build those foundational pieces from the bottom up, a child is much more likely to be successful with all tasks instead of just having single splintered skills. By addressing needs in a natural recreational setting, children can begin to generalize the information more quickly giving them the ability to maximize their potential. 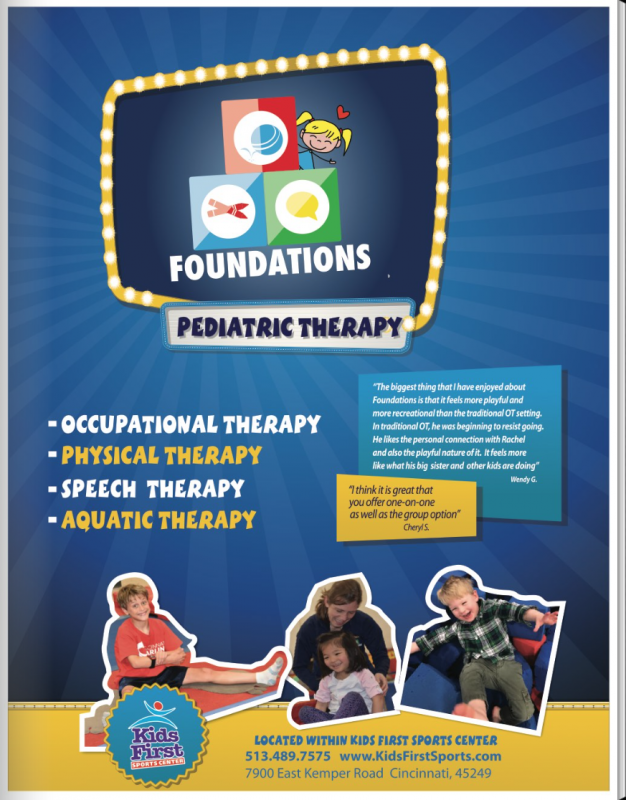 Foundations is the first pediatric therapy program to be offered in a recreational setting. By providing therapy in a natural environment, it encourages greater carryover of skills for everyday life. In addition, by receiving therapy at Foundations, you will build up a team of people who understand the needs of your child and can continue to facilitate his/her growth beyond therapy into recreational classes. Foundations small group therapy sessions are designed for children with speech and language delays, developmental delays, learning disabilities, ADHD, Autism, Asperger Syndrome, Sensory Processing Disorder/ Sensory Integration Dysfunction, ADHD, Dyslexia, Cerebral Palsy, Anxiety and other mental health problems, Down Syndrome and a variety of other chromosomal abnormalities. For individual treatment and most of Foundations groups, an evaluation must first be completed by a licensed therapist (exception—see Joy group description). This will allow that professional to get a true picture of the strengths and needs of your child and how best to help him/her reach his/her goals. Evaluations lasting 45 minutes to 1.5 hours will consist of working with the child in a play based setting, consulting with the parent to gain critical information, and/or using standardized testing tools to identify area(s) of need. Fee: $266 ($212.80 [deduct 20%] as long as Charter Memberships remain available). Insurance billing: You may submit for reimbursement but we are not billing for clients at this time. $35 Cancellation Policy: Cancellations with less than 24 hour notice will incur a $35 charge from your account card. This evaluation is for children who have a current evaluation which is three months old or less from another organization. Parents are required to submit prior evaluations for review ahead of scheduled session. Once reviewed and accepted, a child and parent can then attend a 30 minute mini evaluation with a licensed therapist for class placement. Fee: $130 ($104 [deduct 20%] as long as Charter Memberships remain available). What motor classes are offered? The perfect small group occupational therapy class for six month to three year olds (split into individual groups based on ability and closer age range) to begin to gain new motor skills in a fun and inviting environment. Parents get to participate in this class to learn ways to integrate the techniques being learned in therapy at home for increased practice of new skills. Rooted in a strong play based approach, this will be a child driven class where children are encouraged to enhance their current skills by exploring new sensations, movements, games, and activities. The core focus of the group will be integrating the sensory information he/she receives from the environment and producing appropriate responses to this information. Other objectives of the group include: improving gross motor skills of balance, coordination, strength, and control; building fine and visual motor skills of strength, control, and coordination; and improving social skills for interacting with peers and adults (including but not limited to increased attention to task and interaction with others). A one-of-a-kind, small group, occupational therapy session designed for 2-6 year olds (split into individual groups based on ability and closer age range) to explore their environment. Using sensory integration principals, this will be a child-driven class where they get to explore a variety of sensory movements and where they are encouraged to enhance their current skills by exploring new sensations, movements, games, and activities. The core focus of the group will be integrating the sensory information he/she receives from the environment and producing appropriate responses to this information. Other objectives of the group include: improving gross motor skills of balance, coordination, strength, and control; building fine and visual motor skills of strength, control, and coordination; and improving social skills for interacting with peers and adults (including but not limited to increased attention to task and interaction with others). Tuition: $323/month (deduct 20% for Charter Membership). A unique small group occupational therapy session designed for 3-8 year olds (split into individual groups based on ability and closer age range) to begin to work on their motor development within a structured and controlled environment. Using fun games and activities such as a motor song, core poses, fine motor work, game time, and a cool down, children will get to practice a large variety of fine motor, gross motor and social skills. These pieces of development are all interrelated, and when they work in harmony, they improve a child’s ability to learn essential information for school such as reading and math, as well as improve functioning in all environments. The core focus of the group will be on integrating the sensory information a child receives from the environment and producing appropriate responses to this information. Other objectives of the group include: integrating primitive reflex patterns; improving gross motor skills of balance, coordination, strength, and control; building fine and visual motor development of strength, control, and coordination; building self-help skills; and improving behavior and the ability to interact with peers and adults (including but not limited to turn-taking, direction following, increased attention to task, and interaction with others). A one-of-a-kind, small group, occupational therapy session for 6-10 year olds (split into individual groups based on ability and closer age range) with a core focus of integrating the sensory information he/she receives from the environment and producing appropriate responses to this information. Using sensory integration principals, this will be a child-driven class where they get to explore a variety of sensory movements and where they are encouraged to enhance their current skills by exploring new sensations, movements, games, and activities. A unique small group occupational therapy session designed for children ages 8-12 years (split into individual groups based on ability and closer age range) to get to practice a large variety of fine motor, visual motor, and gross motor skills. Social skills and interaction skills will also be addressed throughout the class. These foundational pieces of development are all interrelated, and when they work in harmony, they improve a child’s ability to learn essential information for school such as reading and math, as well as improve functioning in all environments. Using fun games and activities in a circuit type format will encourage independence and ownership of skill development while allowing therapist to individualize activities to each child assuring a just right challenge for each of them. WHAT SPEECH CLASSES ARE OFFERED? Is your toddler a late talker? Come sing, dance, and play your way to better communication! Because you are your child’s most important communication partner, we invite you to join in the fun with your child. In an environment where it’s safe and fun to communicate, we will try making new sounds, using new gestures, and understanding/speaking new words. Taught by a licensed Speech-Language Pathologist, you will also learn techniques to try at home, during your everyday routines that stimulate speech and language development. This diagnostic therapy group will use a total communication approach where speech, sign language, and pictures will stimulate your child’s ability to communicate. Vocal play is incorporated to build the neural connections necessary for oral motor coordination. Responsive language strategies are modeled and explained in order to encourage your efforts to work on building your child’s receptive and expressive vocabulary outside of our group time. Following the screen for Joy classes, individual therapy may be recommended in lieu of the group setting if your child is having issues with social communication. As your child’s social communication skills progress during individual therapy, a group setting may become effective. What do you get when you combine kids, speech therapy, music, and space to get your wiggles out? An engaging environment which motivates and stimulates learning! Now that your child is more independent, he/she will enjoy a little time away from mom and dad to get those wiggles out while learning to communicate more effectively. We will work on goals such as following directions, answering questions, retelling stories, language concepts, learning and reinforcing newly acquired sounds, and interacting with peers while we sing, dance, jump, and wiggle! Your clinician will use visual supports, responsive language strategies, and scaffolding to help your child process and express new language and sounds. Activities targeting articulation carry-over, receptive language, expressive language, and pragmatics are incorporated into each session. Groups are individualized based on the each child’s needs and goals. What do you get when you combine kids, speech therapy, music, and space to get your wiggles out? An engaging environment which motivates and stimulates learning! We will work on goals such as following directions, answering questions, retelling stories, language concepts, using complex sentences, reinforcing newly acquired sounds, and interacting with peers while we sing, dance, jump, and chat! Description: One on one occupational, physical and/or speech language therapy services (one service per session) provided based on your child's individual needs and goals determined by the evaluation process. A great option for parents seeking intensive services within a unique setting with access to amazing equipment while maximizing your child's growth by individualizing each session to his/her needs. Fee: $514/month (deduct 20% as long as Charter Memberships remain available). 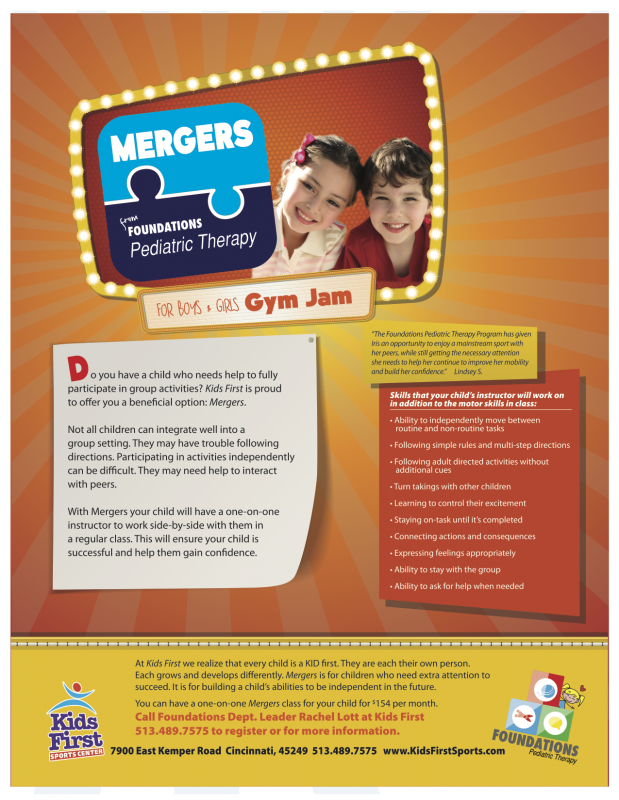 MERGERS a one on one instructor for your child. The instructor will work side by side with your child in a regular class. This will make sure your child is successful. And, help them to gain independence. Spots fill quickly, so call 513.489.7575 today to schedule an evaluation for Foundations, the program that’s all about helping your child be the best he/she can be! *Private one on one sessions also available per request. Class options are continually being updated, so feel free to call or check back often for the latest offerings. Rachel Lott is a seasoned licensed Occupational Therapist with over 15 years experience. She is certified in Sensory Integration and has dedicated her career to working with children of all abilities and helping them maximize their potential. She began her career while still in college by working both one on one with children in their homes, and at a special needs and inclusions day camp program in Cincinnati. These experiences gave her unique perspective on the needs of a child through the family’s eyes, to include the definite benefit and need for inclusion for children. While she has spent the majority of her career working in area school districts, she has also worked extensively with the birth to three population. In addition, she has also worked for Cincinnati Children’s at the Pearlman Center –for assistive technology and has done aquatic therapy. Rachel is thrilled to be offering programming at Kid’s First. She feels it is the perfect place to help all children grow and learn.